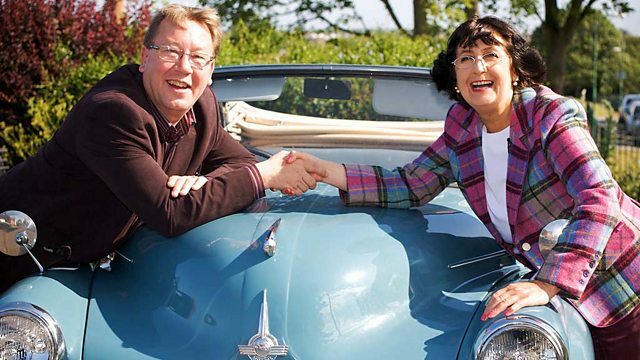 Antiques experts Philip Serrell and Charles Hanson begin the second leg of their road trip in Stafford. They head through the Midlands before crossing the Welsh border. The aim, to make the biggest profit at auction, but it is no mean feat. Philip Serrell and Charles Hanson. -It's quite leafy, isn't it? -I think that's got something to do with the trees, Charlie. Philip has an eye for the finer things in life. That means Hanson wouldn't be allowed to sit on this. -Would you be open to an offer on the whole lot? I'll listen, but I won't accept. Oh, no. Don, I'm your mate. Charles is providing the music. Oh, lordy. But he has got plenty to sing about. As on the last leg, Charles did very well indeed. I'm spinning. My head is spinning. But Philip isn't prepared to take defeat lying down. putting him nearly £55 in front. But on this leg Charles will be shopping in Philip's hometown. I phoned them all up. "is coming here tomorrow, kipper him." That's what I told them. "Absolutely kipper him." Now, now, Philip. Play nice. before crossing the Welsh border for auction in Brecon in Powys. In the 1800s, Stafford had a thriving shoemaking industry. as he is as tough as old boots when it comes to finding a bargain. Ha! -Hi, I'm Philip. How are you? -Fine, thanks, Phil. How are you? Ian. -Ian, good to see you. You've got some interesting things here by the looks of things. Surely enough to inspire your first purchase of the day. Let me have a look at this thing that I saw in the window. HMS Essex was a Welsh-built armoured cruiser launched in 1900.
surviving action in the First World War. so maybe the chief engineer, stoker, maybe even the captain. -But is the price tag a gift too? -Give me the ticket price. The ticket price is £110. -£110, OK. Has it been in here long? -OK, so it's been in a year then, really. Phil knows your game, Ian. I'm sure he'll find something that will turn a profit. and it's just a little pencil sharpener. -And what's the ticket price on that? -That might be an option, mightn't it? One to consider and definitely in Philip's price range. As is this. Oh, that's quite sweet, isn't it? This could almost be Del Trotter's because we've got London, Paris. We haven't got Peckham, but we've got New York, so it could be. This is a Del Trotter ladies' needle case. Or not needle case. The ticket price is £20. He who dares, Philip. He who dares. a nail file and another wax out your ear-hole job. Yeah, I think I'd probably rather a doctor do that, wouldn't you? made by the Tri-ang toy company. have that little label on a wooden toy. There is just a nice attention to detail. Lovely wheels, look. but at £55, could it be too upmarket for Phil? lose any money on it, are you? of disappearing up my own backside without any help from anybody here. That's not savoury. Phil's four items come to £205. That's £50 more than he's got. I was trying to get it for under 100 quid. So you twitched there. I hate it when people twitch on me. -Did you feel any pain at all then? -Yeah, I did, actually. Yeah. -You could have it for £110. Death. This is always good, this bit. I like this bit. Two, four, six, eight, ten. -How does that look, then? -This doesn't normally work. You do realise that. You have been very, very kind to me. where he ended up making a loss. I hope he's not being too hasty here. and played a key role in royal history. He is meeting Malcolm Astley, who will be showing him around. -Good morning. How are you? I'm Charles Hanson. Malcolm, good to see you. -Malcolm, what a wonderful building. since his marriage to a Roman Catholic. led by MP Oliver Cromwell's New Model Army. The King's forces were crushed and England was declared a republic. Persecution of Catholics was widespread. who was not only Catholic but staunchly royalist. -This round here was in fact known as Little Rome. before seeking refuge at Moseley Hall. -was then the orchard, through here and that is the very door. -That is the door that Charles came through. So Charles I beheaded, Charles II came through that door. -and take a wander through that door as well? -I'll follow your lead, Malcolm. -Come on, then. Let's go. -hiding at Moseley Hall at the time. -So, Malcolm, where are we going? We are going into the priest's bedroom. Father John Huddleston. but, of course, he gave up his room. The priest said, "You have my bedroom." -This is the room Charles used. stayed in when he was being chased by Cromwell. Being chased by Cromwell's Parliamentarians. -That is the bed Charles used. that Cromwell's troops could come knocking at any time. -here on the door, looking for the King? immediately thought, "Goodness me, they've come for the King." and down a priest's hole to hide him from the potential captors. -So the priest hole is here. Down there, that is the priest's hole down there. Get down! -So down I go, Malcolm. And I would hide a trap door over it. -Over there. No candles, nothing. -There's no mice, are there? -Are you sure? No rats, no rodents? It's so moving that this priest hole was so pivotal to English history. It really was. A matter of a few hours and a whole thing changes. Our whole history is based on those few hours down there. -They've gone, come on. You're OK.
Charles knew he couldn't stay at Moseley Hall indefinitely. He departed for nearby Bentley Hall, where he met Jane Lane. She helped him flee England to France. and wrote to her after his restoration to the throne. "which I hope I shall live to pay in the degree that is worthy of me. and to play King Charles II is one thing I won't forget. -And I am so grateful. It is, but not for too long. and there's only one thing on their mind. Gosh, they seem like they're in a jolly good mood. It must be all that cash in their pockets. Get out, Charlie. Get out. -Charlie, you're leaning all over me. I can't get out the car. Mad, mad, mad, mad, mad. First stop for Charles is a place called TwoJays. something that can make a profit at the Brecon auction. So you want something Welsh? Welsh, which might just salute the auction house we're going to. -I've got the perfect things. The perfect things? That's quite the statement, Jacqui. they like copper lustre and these bits here are very Welsh inspired. I suspect this sort of copper lustre could actually cause a stir. It looks like Jacqui was right. well within the budget of our man with the plan, Charles. Jacqui, is there much outside at all? -There's some garden furniture outside. -Could I have a look? Eh? Garden furniture? I thought you had found the perfect item. -Jacqui, what are these figures made of? These ladies. -I think they are just cast concrete. Not copper lustre then? Do the Welsh love concrete too? they've been really quite cheaply put together. Great hidden in the garden. Under a tree or in a flower bed. and they're not that old. Why do I feel an offer coming on? How much are they, Jacqui? What is your best price on them? are the pair of lions over here. What was that you said earlier about buying for the Welsh auction? They look wonderful at the edges of drives, don't they? People have that grandeur and that distinction having a pair of lions. he has had all of his legs detached from the base. -So transport must be very careful. Yes, these lions are badly damaged. At least they will go well with the three statues. What is the best price, Jacqui? Between friends. Yes, that's a lot to think about, Charles. and £40 for the Welsh inspired copper lustre. I have a bad feeling about all this. You can hear the thunder outside, can't you? The thunder is rumbling, saying, "Come on, Hanson, you know. "You've got to make a decision now." As the clouds gather, it is make-your-mind-up time, Charles. I quite like your three Graces. And the lions. And they are the two I would like to buy. If I bought that whole lot together, what is the best price? Because they're modern and haphazard, I'd pay about £50. but you can't argue with a £70 discount, can you? Let's give it a go at auction. Looks like he might need it. But for now it's time to call it a day. So night-night, you two birds. and Charles is feeling inspired by the scenery. Look at these trees here. You could just be in the middle of a rainforest. You could be in Brazil. but I end up with him. leaving his pockets still bulging with £141.40. Philip spent a bit more. pencil sharpener and manicure set. That leaves him just £66.46. And having lost the first auction, he is eager to make it count. it genuinely doesn't matter who wins, as long as I do. They're making their way to the market town of Ludlow in Shropshire. Charles's first shop of the day is Bayliss Antiques. -Two years, something like that. finding your way around Don's shop, then. with his parasol in his right hand. waving, in his left hand, his hat. They remind me of Charles and Philip, actually. and is popping into the Secondhand Warehouse & Antique Centre. and I know the people that run it. I just hope they don't hold that against me. Philip is like a man on a mission. A lean, mean, shopping machine. One thing is for sure, I have got £66 and 46 new pennies. I am going to spend £66 and 46 new pennies. Every last one is going. Hmm! I'm sure dealer Stan will be glad to hear that. and I'm sure Philip can find something here to float his boat. Oh, I think that's a cool thing, isn't it? That is a lovely thing. That really is an age gone by. And you've got this - "First class only." But that is just a really cool thing. because at the minute, that look is absolutely fantastic. That's the sort of look that people want. Do they want that in Brecon, though? Good question. It is priced at £68, so you are £1.64 short. I think that is a really cool thing. You've got £68 on that, Stan. What is the best on that? Well, we could make it £58. that is going to ensue. So let's just practise this embarrassing silence bit. OK, you be quiet and I'll think of something else. Oh, dear. This is embarrassing. -£45 for it. What could you do? I tell you what, you're lovely people here. Just give me your best shot. I'm giving you my silence at the moment. Oh, is it my turn to say something, then? What is the very best you can do? -And don't ask for any more. No, I won't go any further than this at all. Honestly, I'm really delighted with that. Let's hope it doesn't sink at auction. and is determined to find something that will help him beat Charles. I should be buying this, really. I can whack him round the back of the head with it. That'll slow him down a bit. Hey, that's not quite what I had in mind. Huh! and it looks like Don has unearthed a candidate for his £120. What are they? Pens? They match your jacket, don't they? it is a market for old vintage pens, isn't it? This marbling is lovely. 1920s pen. Conway Stewart are a luxury pen manufacturer founded in 1905. Their pens can be quite collectable. along with a box of assorted silverware. and the coinage, it's silver. The coins are probably worth £30 or so. -Yeah, that stamp's silver as well. Don misses nothing. There we are. put a shine on Charles's fortunes? aren't mega. The pens are pretty standard. Well, I'll listen, but I won't accept. Oh, no. Don, I'm your mate, Don. Don, I'm your mate. Yes. Until you make an offer. but Don won't let them go cheaply. the tin, the coins and the pens - what is the best price? £75. God knows what it's worth, those bits of silver. If I said to you, Don, £60. Why don't we go in at £62.50 and meet halfway? So, I will give you an extra £2.50 for good luck. We'll cross fingers and hope for some good luck. OK. Thanks, Don. That's great. Luck? I thought this was all skill, Charles. is looking out for something that will appeal to the Brecon auction. I quite like this porthole. It's quite nice. Look, it's got the maker's mark here, which is Simpson. Oh, Simpson Lawrence of Glasgow. Yeah. Via the scenic route, maybe. rather than anything that is overly big. and I'll ask Stan if he can put this by for me. which is more than is left in Phil's pocket. That doesn't stop him eyeing up more goodies, though. So, this is a little vegetable ivory. Vegetable ivory is a root, isn't it? It's not ivory at all, but it's made to look like it. Not anything to do with elephants, no. No, it's got nothing to do with that at all. The case is actually made from an Amazonian nut. The thimble could be the work of Charles Horner. It's got a ticket price of £20. Charles Horner is the man, isn't he? Yes, Chester. Because most of his stuff was assayed in Chester. So, that might be a possibility. and then we've got its little case like that. Right. I think it is time to make your mind up, Philip. and I think a porthole might be stretching the theme a bit too much. on the Brecon and Monmouth canal. Jeez, what a salesman, eh? I want to spend every last penny. This is every last penny, look. That is still £26 short of Stan's ticket prices. Let's hope he is in a good mood. Well, we could let you have that for your £36. I'm over the moon with that. Before I change my mind, shake my hand and let me walk off. -You've been really kind to me. Good to see you. Bye. And with that, he's spent every last penny. Charles, meanwhile, has made his way over to Worcester in Worcestershire. He is on the hunt for more goodies to complete his haul. -What a wonderful shop exterior you have. Gabrielle, good to see you. This family-owned business has been established over 100 years. Can Charles find something timeless here that delivers him a profit? If you can't succeed here at buying quality, you never will. might they just be out of reach? -Charles, you ought to have a look at this. -I saw that in the cabinet. Yes. -Glad you've got your tartan on. -Oh, yeah. Oh, quite right, quite right. Oh, how nice. Well, that's interesting. "Lindsay's Mercantile Academy of Glasgow of the year 1856." "For the first prize for the best specimen or penmanship." And the winner is George Buchanan. this medal is in perfect condition. And at £65, it is within Charles's budget. And it is all there. And it is a real work of art. It really is. if that obviously left you with a profit and it was worthwhile. It is a fair price and it is a reasonable offer. if I don't spend my entire budget in my last job. -Just have a look at this. -Anything which could be £20? and I'm sure Gabrielle will be able to help you part with that. I don't know. But it is nicely made. -This is a sewn one, it's not a printed one. So, with my £23.90, what I could do is viably buy this flag. -It ought to make £25, surely. -I would have thought so, yeah. -It's got a bit of age to it. Could I call it World War II interest, do you think? Or is that going a bit too far? Could it be Second World War in period? -It's certainly vintage, isn't it? -Vintage, I like your style. -I will take it for £23.90. That is my entire budget blown away and Philip will be delighted. it looks like Charles is ready to do battle at the auction. Prescott Speed Hill Climb, which is home to the Bugatti Owners' Club. But it's not the classic Italian race car itself Philip is here to see. and became one of the world's most successful racing drivers. He is meeting Ian Paton from the club to find out more. -Hi, Ian. How are you? William Grover-Williams was an extraordinary racing driver. he had an early fascination for automobiles. driving a Bugatti and won. all the way up to the casino, watching the race. And remember, this is not like today, that we do two hours' racing. This race lasted 3 hours 52 minutes. with either a leather or, at best, a cork helmet. Williams raced in a cloth cap. -Yeah, that sounds a bit risky in my book. cementing his position as one of racing's true greats. he joined the Royal Army Service Corps to help the French Resistance. And eventually, the Gestapo found out about them. and he spent quite a long time in Gestapo headquarters in Paris. and they transferred him to a concentration camp in Germany. And he was shot in the early part of March 1945.
when you think it was six weeks before the end of the war. is held by the Bugatti Owners' Club. and is now the centrepiece of their annual Williams Trophy race. -Now, are your hands clean? -Oh, that's just fantastic, isn't it? and being able to hold that is one of them, really. and the Prince of Monaco hands you the trophy. -You would be so pleased with that, wouldn't you? Look at that. That is just fantastic. His competition has arrived, though, so it is time to reveal all. -I like the waistcoat, Charlie. -We're going to Wales, not Scotland. I'm going to start here, Phil. they will roar outside someone's drive in Wales. I think you're insulting the Welsh. I think you're insulting Charles, so that makes it even, then. Yeah, they are. They're a bit tired, Phil. But you know, they're like you and I. They're a pair of well-worn lions. Charlie, they are smashed. They are rubble. Yeah. What are they worth? -I'd rather not go down that road, Charlie. I don't want to go down that road because I don't want to upset you. You're my mate. How much did you pay for them? My next ensemble, Phil, is there. who I presume were too busy to make it today. about 4'5" high, and they probably depict the seasons or the Muses. -Sorry, can I just stop you just for one minute? -You bought three of them? I don't want to be really picky here but are there not four seasons? -Um, yes, there are really, Phil. -I thought there probably was, yeah. -So, you've bought three of the four seasons? -Fine. Why did you not buy four? There was only three available. All right. So, what have we missed? Autumn? Winter? -Winter is a good one to miss, isn't it? but what will Charles think of his goodies? I do worry about him sometimes, honestly. Whoa! Oh, Phil. Goodness me. Oh, wow. What is this here? HMS Essex. Tell me about that. I can't really because I don't know anything at all about it. and then these bars here. I have absolutely no idea what it's for. and a real object, which is just pre-First World War. That is really interesting, Phil. that could be quite a rare thing. There's a real maritime feel, isn't it? You've got that, that, and this porthole, which is nice. I wasn't sure if you were going to stop to draw breath. I think you've done really well. Charles likes what he sees, but I can't say the same for Phil. Those lions, they're smashed to pieces. And knowing Charlie, they might go and make £30. But dear me, they are awful. He's bought objects which are quite cheap. and I think all the objects will make small profits. and it really is game on now. He wants to catch me up. Feeling quite smug with myself now. That's normally when it all goes wrong, isn't it? and is the final resting place of Norman lords and Welsh princes. have arrived at the venue of today's auction showdown. on what our discerning experts have bought. Some mixed bag of items you've brought along. You've brought some very nice statues. they will find a home in Wales. Very interested in the medal you've got from HMS Essex, I believe. so that'll be interesting to see how that goes. and has spent every last penny on five auction lots. Thank you very much. You've been really kind to me. and he too has parted with it all for five auction lots. But although Charles won the last auction, Philip's feeling confident. Have you ever lost one of these Road Trips? I've lost one. To you. -Oh, was that to me? First up, Charles's silver medallions and assorted silverware. 20 I've got, thank you. At 55, 60. 60 I've got. Try a little bit harder, sir. At 62. 62, 65, 68, 70. I want you to know I am getting no pleasure from this, none at all. Philip knows that opening loss for Charles could bode well for him. How terribly sad. How awfully sad. 30, 20. Let's have £10, kick it off. At 10 bid, 10 bid. I sell it at the back, then, at £30. That's just what we call one step forward, two back, Charlie. which means the gap between the two is closing. Next, is the writing on the wall for Charles's early fountain pens? Do I hear something in the region of £50? At 25, 30, 35, 40, 45. 62, 65, 68. 68 I've got. At £72, with a tin as well, at £72. And so you should be - a £42 profit is absolutely marvellous. I'm just getting really anxious about the rubble now. -It's a funny old game, isn't it? No, that won't be funny. I think someone is feeling nervous. if there is a profit in Philip's bronze porthole. £40 we've got. At £30 and selling. 40, 50, 55, 60, 65. 65, 70, 75. 75 I've got. Selling at the back of the room. -He's doing a good job, isn't he? -Yes, it's good, isn't it? -That's about 40 quid profit. It is closer to £60 than £40 and it means Philip's really catching up. you would not be down for long, OK? -And you are back in business. -You know, you are the Godfather of the Road Trip. will his wooden toy horse and cart pull him into the lead? 55, 58, 60, 62, 65. I love the way you wink. At 70 bid. Anybody else? Two lots here together. At £70, cashed and done. Going, going, gone. Well done. I'm a little flushed now. as they are now neck-and-neck. I'm not wearing a hat, but hats off to you, I mean it. Philip's penultimate item is the Navy medal. if he's going to win this auction. Let's have £20 to get it going. 10 I've got. 12, 15, 18. It's going to run and run and run. -It's going to run and run and run. 65, 70. At 70 bid. -Going, going, gone. Well played. He does a good job, doesn't he? -He does a really good job. And with that, Philip nudges way ahead of Charles. Could he be on the verge of victory? I'm happy as Larry. I'm happy as Larry. 110 all done. Sold at 110. -That's jolly good, isn't it? -The rubble has made £50. -How has it done that? -It made... I'm sorry, it's made £50. and it has given him a small lead. Charlie, how you've got that for those stone anchors, I don't know. -I think they were cheap. It all comes down to the last few items. Will Charles's RAF flag fly him further into the lead? 50. 20 to start it. 10. 10. Thank you, 10. 40 bid, 45. 45, 50. Yeah, keep going, keep going. -Charlie, you've whipped me again. -How am I going to live this down? 85. Lady on the right, sold at £85. and an ocean opens between the two. But can Philip close it with his first-class liner deckchair? 20. Thank you, 20 opening bid. 20, 30, 40, 50. 50 bid. At 60. Is that 65? No. 60. A good profit for Philip, but is it enough to overtake Charles? His final lot are the concrete lions. The lions, as somewhat damaged. Somewhat damaged? If you like Longleat, Charlie. Bid 20 onto the lions. I just don't believe this. -I just don't believe this. -Give me a roar, give me a roar. 70 I'm bid. Sold here at £70. Charlie, you have absolutely whipped my behind, Charlie. I think Philip is in shock. The bidders loved Charles's lions and have given him a £50 profit. -Let's go back to Blighty. -Go, go, go, go, go. After a dramatic auction, it is time to do the sums. ending this leg with a juicy £254.20. and winning this leg of the Road Trip. -Back home, Phil. Up the M5, that's the way. and he has caught Phil's attention. Philip Serrell and Charles Hanson begin the second leg of their road trip in Stafford, Staffordshire. They then travel through Wolverhampton and Worcester, before crossing the Welsh border for the auction in Brecon, Powys.